Angela and one of her pharmacy classmates, Meg, had scheduled to attend a conference/training seminar out in Monterey California in early April. Well, the two wonderful women that they are decided that taking their husbands along (Travis and me) would make the trip even better. Of course, when Travis and I are involved, there will be outdoor activities! Quite possibly for the first time in our traveling together, we made it to the airport with plenty of time to spare. The four of us actually even got some breakfast at the terminal before boarding. As always, flying out of Richmond means flying to a carrier’s hub and if that carrier is Delta, that hub is probably Atlanta. Atlanta is a brutal airport if it is your final desitanation or if you’re connecting flights end up being at Terminal A and E. However, neither was our case and we made it through without any troubles. Angela and I watched The Stepford Wives and about half of The Life Aquatic on the flight out to San Jose, CA (until the battery died, that is). Arrival at San Jose’s Terminal C is like passing through a sardine can but fortunately we caught a sunny California day once we got outside. Travis grabbing some hiking gear from the back of our over-stuffed H3 rental. We went to pick up our pre-reserved rental car, which using Travis’ rental club member status, was supposed to be sitting there waiting on us. However, they were backed up and offered us to upgrade. 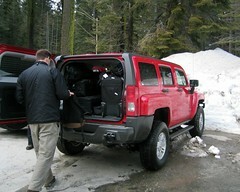 Come to find out, upgrading from a medium four-wheel drive gets you a Hummer H3. Aslo come to find out, a Hummer H3 is really just a medium sized four-wheel drive with a lot of extra plastic and really small windows. We knew we’d be required to have tire chains in order to enter the park this time of year, so we spent a little bit of time while still in San Jose to track down a auto supplies store that could sell us some chains. We really didn’t care if they even fitted as we had no plans on using them, but they actually did have some that fit the H3. Anyway, we were simply going to return them to a store of the same chain in Monterey after we left the park (of course, not if we had actually used them… that’s what eBay is for). Well, we arrived at the park just before dusk. There had been some detours along our route do to rock/mud slides but we did get to see some of the parks great views as we drove in. The next day, we quickly realized why they called our chosen accomodations the Lodge at the Falls. 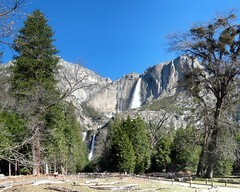 We had an amazing view of Yosemite Falls from pretty much anywhere in the lodge’s campus of buildings. We took the (free, hybrid powered) bus up to Curry Village to partake in the huge breakfast buffet before attempting our big hike of the trip: Upper Yosemite Falls. Breakfast was delicious and Curry Village was fun to tool around in. Travis picked up some nice gloves in the outdoor shop there before we hopped back on the buss to our trailhead. The hike from the valley to the Upper Falls is, as one might expect, almost entirely uphill. However, there are some really great pay-off moments. One of which is at Columbia Point, where you get a wonderful panorama view of the Valley and some of the notable geological features. However, we were interested in getting up to some even higher ground so we headed on. Of course, rounding the bend to come in sight of the falls takes you to the North slope of the part of the valley wall you’re hiking up. That of course means: snow! Well, we hiked as far up as we were possibly prepared for in the clothing we had on. Now, I should say that we were prepared from cooler weather, but not hiking in waist deep snow. However, it was still loads of fun and worth every step, even if we didn’t make it up to the top. The view from panoramic view from Columbia Point along the Upper Yosemite Falls trail.